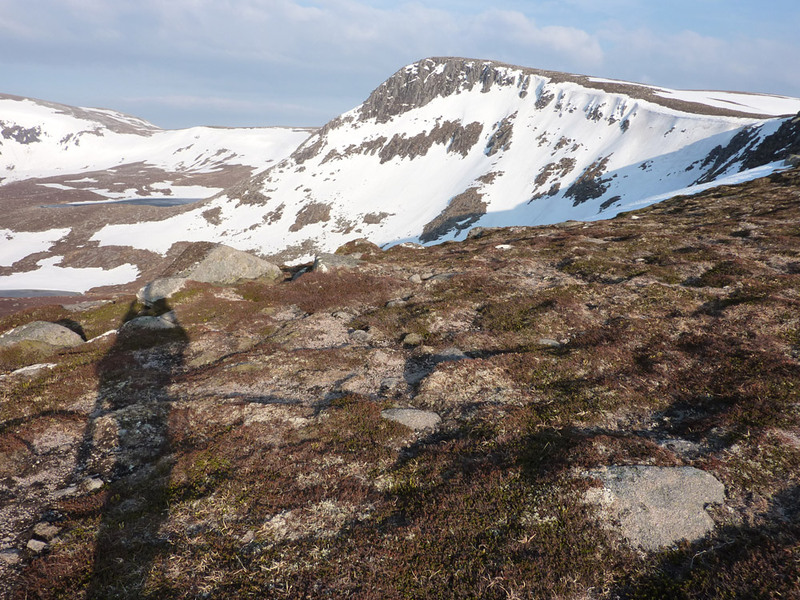 Albeit of shorter stature than the great North-East corrie of Lochnagar, there are several short descents to be had either side of the imposing Stuic buttress. Providing the snow is stable, the skiing here can have a slightly more friendly feeling than the main corrie. The most logical approach if you are only planning to ski in this corrie is to park at Keiloch (NO188913) , just to the North of the Invercauld Bridge. Land rover tracks make their way through the Ballochbuie Forest, passing through 4 gates until you come out of the trees and end up at a small open pony shelter next to the Feindallacher Burn. Assuming the lower ground is snow free, a bike is useful for this approach. You can cycle as far as a small pony shelter at the end of the track (NO204874). From there you can either follow the path up onto Carn an t-Saigairt Beag and traverse to the The Stuic, or take a more direct approach across boggy heathery ground. The most direct route back to the plateau following a descent is to scramble up the buttress of The Stuic. This can be awkward (if in ski boots and carrying skis). Although only Grade I under winter conditions, it can be quite tricky if you are not familiar with some of the bypasses to steeper sections (mostly on the left). If that doesn't suit, it's not far to either of the easy ascents at the West and East of the corrie. 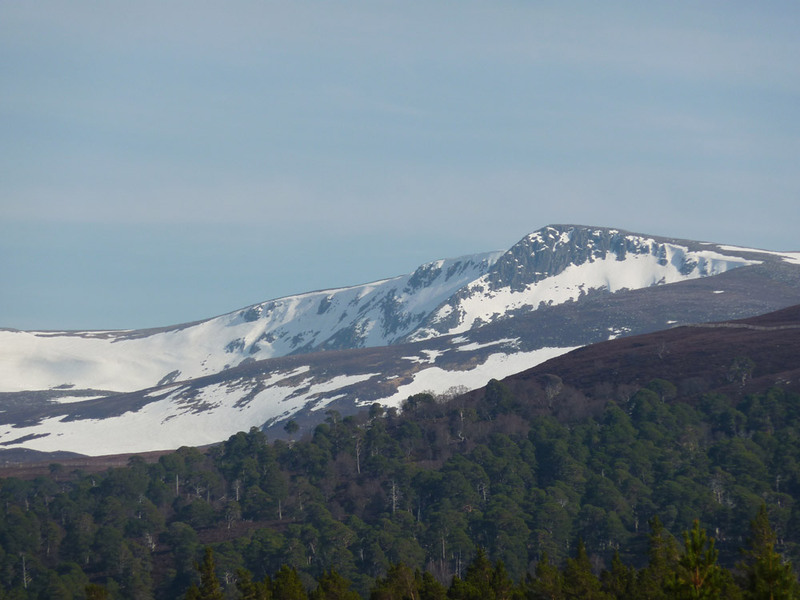 There is one relevant Scottish Avalanche Information Service forecast for Lochnagar: The Stuic. 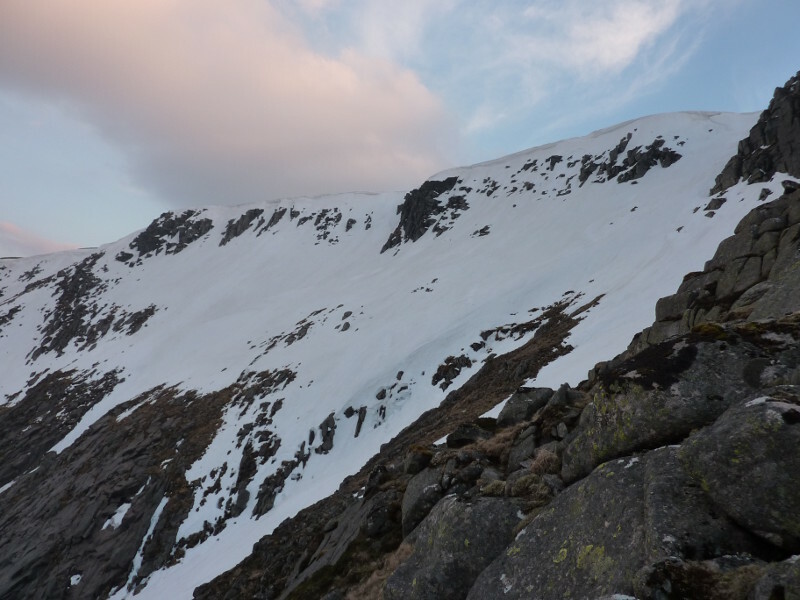 There are a couple of obvious options on this face, both with steep starts through the upper band of crags, and both finding a way through the lower crags. The line described is the most gully like. Start just a few metres to the South of the summit of The Stuic. Traversing in from skiers left may be the best option to get in below the cornice. The angle immediately relents, and you will find yourself on a big slope which appears to come to an edge. The edge is the lip of an awkward steep sided scoop about half way down. It's worth scoping out the possible entry into this scoop from below if possible, as the entry is above steep craggy ground. It appears that skiers right holds onto the snow the longest, and can offer the last way through the rocks. It may well be that in good conditions, it's possible that a deviation is not required. 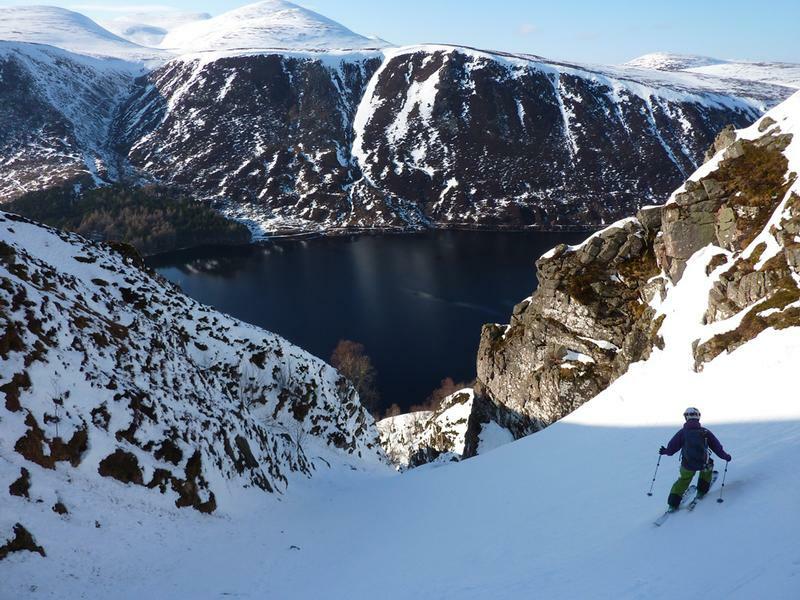 Once into the scoop, the descent is very easy all the way down to the loch. The need for care in approaching the scoop means that it isn't as satisfying as other lines, but it's still a nice place to ski. Notes: 2 short steep sections: right at the top, and entering the scoop. Otherwise easy angled. Directly below the summit of The Stuic is a line of crags that are about 80m at their highest. Heading West from the summit, they diminish in height until short snow gullies can be found to give access to the slopes below. The line described descends the descent gully often used by climbers. 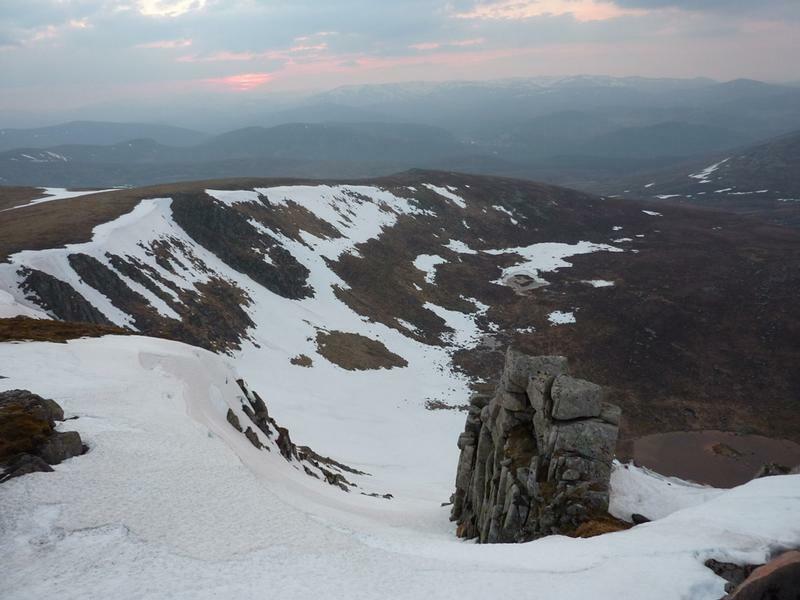 It is characterised by a rocky pinnacle on skiers left at the top ("Stegosaurus Rib"). 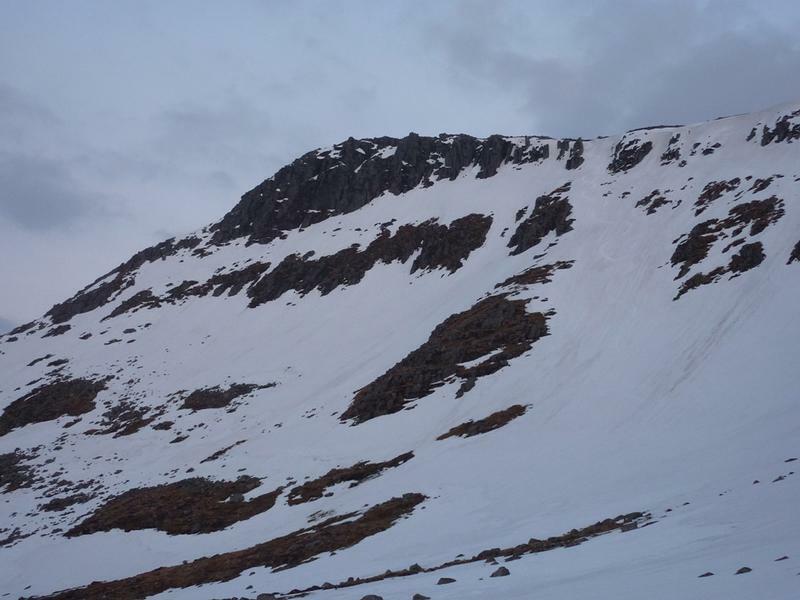 The angle is considerably less than the companion North-East flank, and gives an excellent ski to the corrie floor, trending slightly left once out of the short entrance gully. Notes: Would equate to a difficult red / easy black run. This is a short gully to the West of the main summit. It can provide a short easy introduction to gully skiing if in the area. It is in reality a shallow runnel at a corner of the cliff line rather than a defined gully, but is worth doing if in the area anyway. 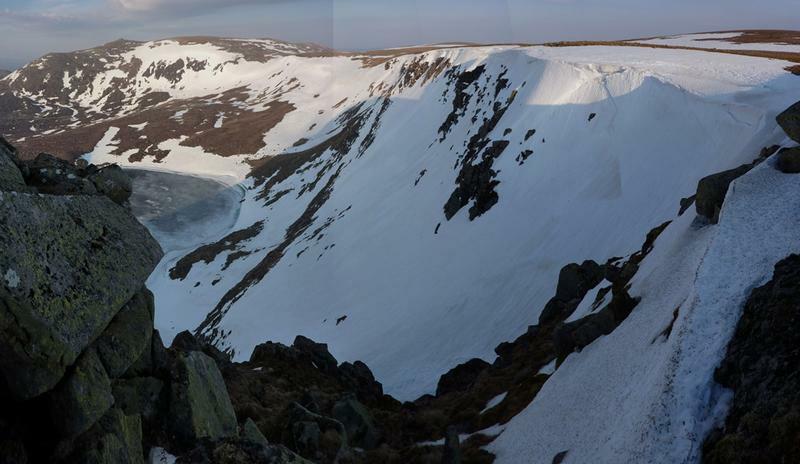 I've labelled it "Feadaige Gully" for the sake of identification, as it is located in Coire Lochan na Feadaige. 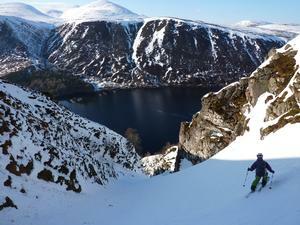 The buttress on skiers left is called "Feadaige Buttress", so it seemed logical to use the name "Feadaige Gully". There is another short, shallow gully on the other side of Feadaige Buttress.